Every two months or so, I’ll remember “hey, I have a blog!” Usually when we discuss things of this nature with friends or clients. So, I’m beginning to feel the pressure to try this again and see how far I can take it. Since I may only have one or two readers left, it may be a short-lived experiment. We’ll see. June 30th marked the start of the Tour de France, which in the spinning world means the start of the Tour de Fleece. Spinners challenge themselves to do something during this time – in my case, I’m going to finish spinning/plying two fleeces I bought in 2010. The first one is Nova, the CVM/Romney cross. I’m down to 4 ounces to spin into singles. Nova is a demure grey. 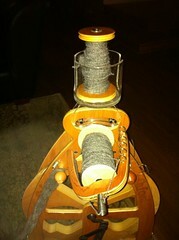 The second fleece is Giselle, which has been spun into singles and I did begin the plying process. 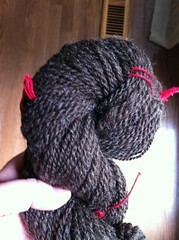 Here’s a finished 4 ounce skein, @160 yards of squooshy worsted weight goodness. Giselle is a lovely brown color. Please excuse the light, trying to get pictures when I remember. And some days are better than others. So, rather than try to play catch-up, I’m going to start where I am in my life – still married (25 years this October! ), newly hatched empty nesters and trying to take each day as it comes. If there’s anybody still here, please leave a comment and let me feel ya! The yarn is looking good! I have spun one day of the Tour so far. Halloooooo! Thanks for saying hi on my blo and the well wishes. It’s been so long! I still think of you and my visit south whenever I attempt to make sweet potato fries or talk about Ethiopian food. Your spinning looks beautiful. Hope all is well in the south.